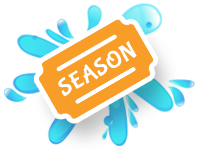 A Season Pass is THE BEST way to kick back and cool off, with unlimited admission all season long! 2019 Season Pass – Only $76.99 for a limited time. Season passes are non-transferable & non-refundable.